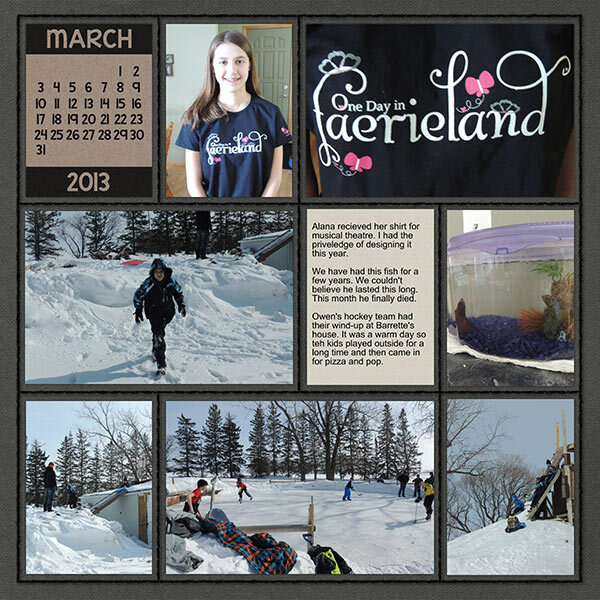 Here is where you will post your February Month in Review pages. Let's see what you did last month! St. Patrick's Day – Take some photos of how you celebrate. Do you wear green or not? Why or why not? Work - Take a photo and journal about where you work. Looking back I would love to read about my grandma's working years. Did she enjoy it? What struggles did she face? Remember we are documenting our lives. What seems mundain and normal to us may not be seen the same way in 50 years from now. Season – Often in March the weather is changing. Take a seasonal photo in the same spot throughout the year to see the changes. Everyday Life – What activities are you participating in this month. Take some photos and write about why you are doing it or what you enjoy about it. Here is one of my album layouts using BP Blocked Set 1 - I switched out the journal cards. Basically just did a layout on what was going on in our lives (i.e. Everyday life).